Ever wondered what hanging out in Hell would feel like? Then, boy, do I have good news for you! 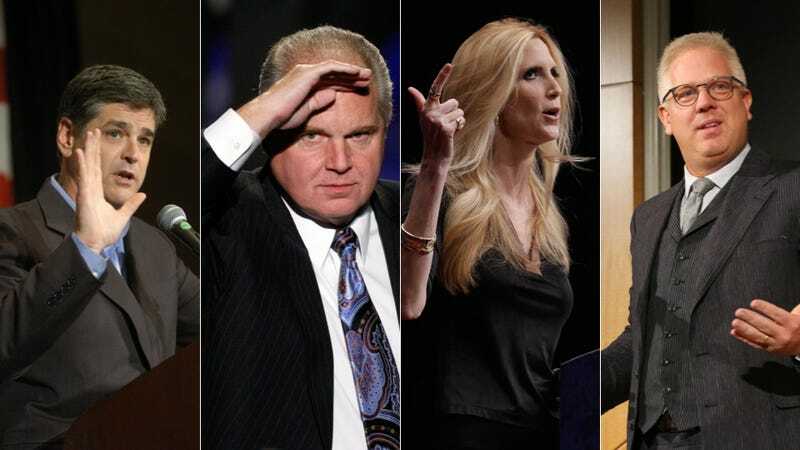 Glistening tear biscuit Glenn Beck has recently teased that he is organizing a conservative summit that might include the likes of Ann Coulter, Rush Limbaugh and Sean Hannity. All under one roof! Oh, and the chairs will be made of FIRE and there'll be a long table full of glorious food that no one can eat because the spoons are all too long to reach their mouths. As a guest on Sean Hannity's radio show yesterday, Beck talked about emailing Hannity to be a part of a big secret project that he's planning for the summer. This was probably just a way to brag that he has Sean Hannity's email address, but BFD, I can also send an email to an a pot of angry Irish stew and you don't hear me going on and on about it. "You and I both know that wherever we've gone, for at least three or four years, people have all said the same thing to me. '...You guys all have to get together. You guys have to get together.'" Interruption to ask who are these people who keep asking them to get together? Vengeance demons? Ghosts who need to come to terms with their deaths by making everyone on Earth miserable? Our Republican aunts and uncles? "And this last fall, we have...and we've found that we all have an awful lot in common and we've found that we like each other. And so I wrote you last night — and I always do a summer event and I haven't announced the event yet, so I can't tell where it is yet...So what I proposed — and you graciously wrote me back immediately "yeah" — is that sometime this early summer, we're going to do an event." Beck's summit tease was originally reported on by his own website The Blaze, so it's safe to say that the threat is imminent.